The annual AESA 2015 AOE/AE Sailors Reunion will be held this year at the Crowne Plaza Hotel in Dayton Ohio September 30th to October 5th. 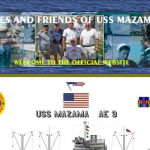 This has been an annual event held in various cities across the US, and last year in San Antonio, TX we had a tremendous turnout for USS Mazama shipmates. There are special rates set up for reservations made in advance of the event. Call the reservation center at 800-689-5586 (24/7 operator). Fully refundable through August 30th. Your reservations will include Valet parking and if flying, free airport shuttle service. Southwest Airlines flies into Dayton. There are several special tours scheduled beginning on Thursday which you can sign up for you and your companion, Wright Patterson Air Force Base, Packard Auto Museum, Orville & Wilbur Wright National Park Service Museum, Dayton Historical Society Park, Carillon Historical Brewery, and a gambling outing at the Miami Valley Slots Casino. This is all capped by the AESA Banquet Saturday evening at the Crown Royale. Our very own, Bill Gohde (AE-9 1965 to 68) is this year’s AESA President. Bill and his lovely wife Kathy will host the reunion. You can also contact Jerry or Beverly King at 909-394-5687 for further information. Hoping to see everyone in Dayton, Ohio. I and the wife would like infoe: on cost of rooms , tours or trips , dinners , and any other information that may be of help. also who or where to send check ? Thanks who ever may answer.